Taxis are an important part of our lives. Especially for cities where other forms of transport are not very accessible, taxis form the lifeline of daily commuters. In fact, for the emerging white collar or pink collar segment of the society, taxis are godsent. Many types of cabs are available in India. There are basic taxis which you can hail on the road (available in cities like Kolkata & Mumbai). Other cities (like Bangalore, Hyderabad) have only radio taxis like Ola, Uber, etc. Taxis aren’t just four-wheeled motorised vehicles. You also have transportation like bullock carts, vegetable carts etc. that are considered similar to taxis in rural and semi-urban areas and who belong to the unorganised sector and never paid any taxes anyways. However, the main impact of GST on cabs will be on the radio taxis, the taxis you hire through an app or phone. GST clearly defines radio taxi as a taxi including a radio cab, by whatever name called, which is in two-way radio communication with a central control office and is enabled for tracking using Global Positioning System (GPS) or General Packet Radio Service (GPRS). This includes cab aggregators like Ola and Uber. It means service tax applied on radio taxis and AC buses but not on normal metered taxis like yellow taxis of Kolkata. Effective service tax was 6%. The same will continue under GST, i.e., the radio taxis and AC buses will be liable to service tax. Metered cabs or auto rickshaws (including e-rickshaws i.e., Ola Auto) will not be liable to GST. GST rate will be 5% without ITC. Uber will collect 5% GST on the fare charged from the passenger. Thus, we find there is a decrease the cab fares. The benefits have been passed on to the passengers in the form of discounts and special pricing. As per the reverse charge notification, radio taxi companies are liable to pay GST under reverse charge. Earlier rent-a-cab services had partial reverse charge mechanism. Service receivers (rent-a-cab services) were liable to pay 50% under RCM if the service providers (drivers) was not availing abatement. 50% was borne by the service provider. However, if Service provider is availing abatement then service receiver is liable to pay 100% of service tax payable on abated value. To remove such confusion and complications under GST, the entire onus is on the service receiver, i.e. Ola. Ola Cabs sign up driver to ply passengers in cars. Drivers are providing chauffeur/driving services to Ola. Ola is the service receiver and pays drivers a share of the fare collected from passengers. For example, a driver is to receive Rs. 100 as share of fare. Ola will pay Rs. 100 to the driver and deposit Rs. 5 to the government. On later providing the service to the passenger, Ola will collect GST on the fare. Ola pays GST on the drivers’ services on reverse charge basis. Ola can claim the ITC on tax paid under RCM and adjust with output taxes payable. The aim of reverse charge is to bring this unorganised sector under the tax umbrella. It also removes the burden of tax compliance from individuals with limited resources (drivers) to large companies (Ola) with enough resources. Companies like Ola & Uber will have 2 options under GST. They can choose not to claim ITC of the tax paid on various inputs. Then, they can pay only 5% output GST . For example, if Uber pays telephone bill then it will not be able to claim any ITC on the GST charged for the telecom services. Cab aggregators can claim ITC of the tax paid on cab servicespaid on various inputs if they pay 12% GST. In the above example, Uber can claim GST on telephone bill if it pays output GST @ 12%. Businesses cannot claim ITC if they take cab services. For example, if ClearTax pays cab services for employees to a convention then it will not be able to claim any ITC on the 5% GST in the taxi bill. Tax on fleet Management Services Tax on Fleet Management Services will get revised from 15% to 18% due to increase in tax on services. Cost of taking a car loan & the subsequent EMIs have increased due to the increase in tax on services (18% from earlier 15%). This means that a pre-GST EMI of Rs. 34,500 (Rs. 30,000 plus service tax of 4,500) will increase to 35,400. Shalabh Seth, CEO, Ola Fleet Technologies, said that its driver-partners currently pay a 14.5% VAT but under GST, they will have to bear 29% to 43% tax on the cars already leased, as an outcome of double taxation. “This will have an adverse impact on their livelihoods,” Seth said. There are already discussions and petitions to the government from the car lessees and the leasing companies. till then, the ultimate burden will be passed on to the drivers. 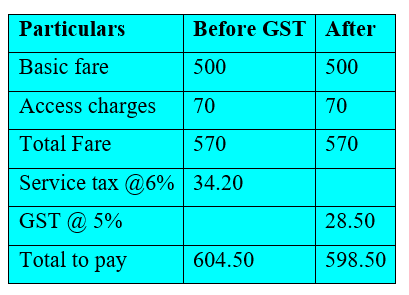 For passengers, GST has been beneficial as it has reduced travelling costs slightly. However, GST poses problems for the cab companies and the drivers due to the tremendous increase in the lease payments. Unless government addresses these concerns, these companies and ultimately the drivers will bear a significant increase in their costs, which may force them to look for employment elsewhere. ClearTax GST is an ultimate solution for all your GST problems. 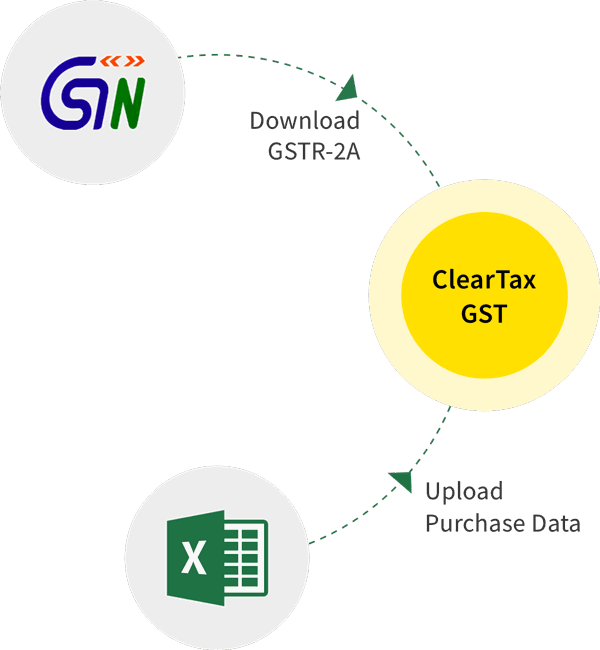 Simply, upload all your invoices (which you can generate through ClearTax Bill Book) and file your GST returns on time. ClearTax has also partnered with Uber to help Uber drivers to file their tax returns.